"We will get our power. We will get our power. We will get our power!" 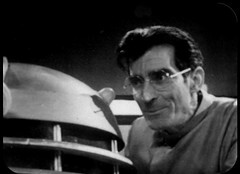 Hensell is pleased with the potential offered by the Daleks. The Doctor orders the Dalek to shut itself down which it seems to do only to reactivate when he leaves the room claiming that the order would have prevented it serving. The enquiry into Quinn's behaviour continues: he is found guilty and imprisoned, with security chief Bragen being made deputy governor in his place. 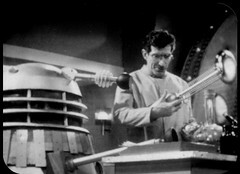 The Doctor builds a device to interfere with the Dalek and brings it to the laboratory. It works but Lesterson smashes it and sends the doctor away before he can permanently harm the Dalek. Hensell departs for a tour of the perimeter leaving Bragen in charge. Janley meets Bragen: she is leading the rebels and he has been assisting them for his own means. She has obtained the Dalek gun that Lesterson removed and believes it will help them take over the colony. Bragen needs the Examiner restrained so Janley and fellow rebel Valmar kidnap Polly. Ben notices Polly's disappearance and worries. The Dalek pleases Lesterson with it's knowledge and persuades him to order some equipment to build a device to help the colony. When he leaves the room the Dalek activates the power to the capsule and goes inside. The Doctor & Ben discover the power connected and confront the unarmed Dalek. 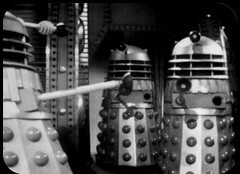 They are forced to leave when the other two armed Daleks appear activated. Bragen confronts the Doctor saying they have found a body in the swamps and suggesting he may not be the Examiner. The Doctor retorts that the only way he could know for sure was if Bragen was the real Examiner's killer. 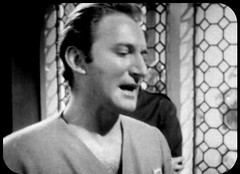 Bragen tells The Doctor to leave Lesterson and the Daleks alone. As he leaves a note about Polly is pushed under their door. Lesterson sees his now trio of Daleks who are pleased that "we will get our power!" This episode moves like a piece of well oiled machinery. It does exactly what you guess it might as the Daleks slowly advance their plan, the rebels start to move and the Doctor finds his progress obstructed. Lovely scene between the Doctor & Bragen as they each call the other's bluff, and at the end as the Daleks' guard starts to slip in front of Bragen. I said last episode that you feel this isn't going to end well and you feel it even more in this episode. DOCTOR: Greed and ambition, that's all it is. Wait till they find out what their precious production figures have cost them! HENSELL: So, Lesterson, they're even capable of speech. LESTERSON: Yes. But then, why not? After all, they have a certain intelligence. LESTERSON: But it is an intelligence that we can control. HENSELL: So what you want is permission to continue your experiments? LESTERSON: Governor, think what it would mean if we were to set it to work in the mines. It could double our production overnight. BRAGEN: Consider the effects it could have on our whole economy. HENSELL: Yes, and the effect of that on Earth. Yes, yes, they could be very grateful. Lesterson in turn pursues the scientific discovery that the Daleks represent, and presumable the fame and renown that will bring him. The Daleks use that as a lure to get the materials and power they want. DALEK: What is this machine? LESTERSON: It computes meteorite storms as they approach our weather satellites. DALEK: How accurate is it? LESTERSON: About seventy percent. It helps to cut down on our satellite losses. DALEK: Daleks can build computers with one hundred percent accuracy. DALEK: If you provide materials and our own power unit, a computer will be built. LESTERSON: A hundred percent? But that would be an enormous saving for the for the colony. DALEK: Then you will get the materials? LESTERSON: I'll go and speak to the Governor at once. DALEK: I will be ready to dictate the blueprint when you return. BRAGEN: You were able to get away then? JANLEY: Yes. Lesterson's with the Examiner. And Hensell? BRAGEN: At a meeting of production managers. He left me in control. JANLEY: We could take over the colony now. BRAGEN: No. No, it has to be absolutely right. I don't want to take over a colony full of rebels do I, Janley? JANLEY: I don't know. You're making me help them. BRAGEN: Only to stir them up to create enough trouble to get rid of Hensell, and then, then we crush them. The whole colony will be grateful, and I'll be Governor. Janley's really the only main character who's motivation isn't clear. She's seemed to be very much part of the rebels but here she's distinctly helping them because Bragen's told her to. Is she involved with him? Is she an agent working for him? Having dealt with the characters & actors who didn't trouble the scorers much in earlier episodes let's look at the rest of the cast. I'd previously quite liked Hensell but now I've discovered he's played by Peter Bathurst who goes on to play the civil servant Chinn in the Claws of Axos who is possibly the most annoying character in Doctor Who. 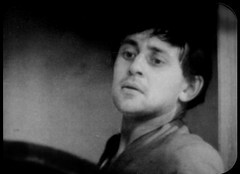 He'd previously been in the Out of the Unknown episode Andover and the Android, sadly one of the two missing episodes from the show's first season, as Barnaby and would appear in three Moonbase 3 episodes as the Director General: Departure and Arrival, Achilles Heel and Castor and Pollux. Bragen is played by Bernard Archard who you'll see again as the possessed cadaver of Marcus Scarman in Pyramids of Mars. 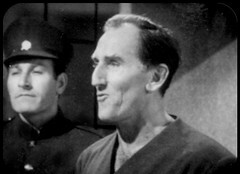 He too has been in Out of the Unknown as Dr. Giddy in Frankenstein Mark 2, one of the missing episodes from the second season. I saw him onscreen as a child playing Eirig in the sci fi/fantasy Krull. 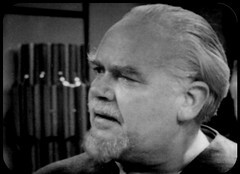 Lesterson is played by Robert James who will be back as the High Priest in the Masque of Mandragora. He's also in the very first episode of Blake's 7, The Way Back, playing Blake's friend Ven Glynd. I spot that the same episode also features Robert Beatty, who was General Cutler in the previous Doctor Who story The Tenth Planet. James has two Out of the Unknowns to his name: he was Dr. Kersh in the first series episode Thirteen to Centaurus, and that one does exist and is available on DVD. He return in the missing third season episode Liar! as Kelvin Brooke. He was in two episodes of Doomwatch as Barker in Project Sahara and Halliday in Flood. I've seen Richard Kane, who plays Valmar, in the Inspector Morse episode Masonic Mysteries as Chief Inspector Bottomley. Nicholas Hawtrey plays second in command Quinn. He seems to have spent most of his subsequent career working in France! 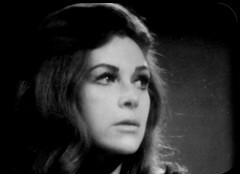 Finally Janley is played by Australian Pamela Ann Davy. She's got two appearances in The Avengers and a couple of ITC series to her name but doesn't seem to have appeared on television after 1970! The "Daleks posing as your servants" idea is re-used in the new series story Victory of the Daleks, where it works fabulously well again. It's after the bit where they're busy being servants that Victory of the Daleks falls apart.